Srila Prabhupada glorifies our purva acaryas. parameśvara-dāsa—of the name Parameśvara dāsa; nityānanda-eka-śaraṇa—completely surrendered to the lotus feet of Nityānanda; kṛṣṇa-bhakti pāya—gets love of Kṛṣṇa; tāṅre—him; ye—anyone; kare—does; smaraṇa—remembering. Parameśvara dāsa, said to be the fifth gopāla of kṛṣṇa-līlā, completely surrendered to the lotus feet of Nityānanda. Anyone who remembers his name, Parameśvara dāsa, will get love of Kṛṣṇa very easily. The Caitanya-bhāgavata states that Parameśvara dāsa, known sometimes as Parameśvarī dāsa, was the life and soul of Śrī Nityānanda Prabhu. The body of Parameśvara dāsa was the place of Lord Nityānanda’s pastimes. Parameśvara dāsa, who lived for some time at Khaḍadaha village, was always filled with the ecstasy of a cowherd boy. Formerly he was Arjuna, a friend of Kṛṣṇa and Balarāma. He was the fifth among the twelve gopālas. He accompanied Śrīmatī Jāhnavā-devī when she performed the festival at Kheturi. It is stated in the Bhakti-ratnākara that by the order of Śrīmatī Jāhnavā-mātā, he installed Rādhā-Gopīnātha in the temple at Āṭapura in the district of Hugalī. The Āṭapura station is on the narrow-gauge railway line between Howrah and Āmatā. 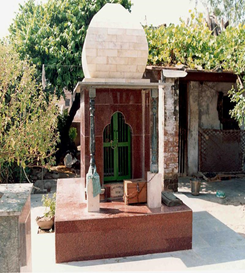 Another temple in Āṭapura, established by the Mitra family, is known as the Rādhā-Govinda temple. 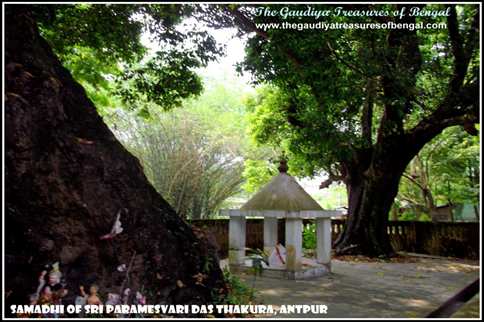 In front of the temple, in a very attractive place among two bakula trees and a kadamba tree, is the tomb of Parameśvarī Ṭhākura, and above it is an altar with a tulasī bush. It is said that only one flower a year comes out of the kadamba tree. It is offered to the Deity. The whole matter is concluded in the Bhagavad-gītā (2.41) as vyavasāyātmikā buddhiḥ, or the absolute path of perfection. Śrī Baladeva Vidyābhūṣaṇa, a great Vaiṣṇava scholar, defines this as bhagavad-arcanā-rūpaika-niṣkāma-karmabhir viśuddha-cittaḥ-accepting transcendental loving service to the Lord as the prime duty, free from fruitive reaction. When Lord Brahmā was perplexed about how to construct the material manifestations in the universe and went down within the water to find out the means and the source of his lotus seat, he heard the word tapa vibrated twice. Taking the path of tapa is the second birth of the desiring disciple. The word upāśṛṇot is very significant. It is similar to upanayana, or bringing the disciple nearer to the spiritual master for the path of tapa. So Brahmājī was thus initiated by Lord Kṛṣṇa, and this fact is corroborated by Brahmājī himself in his book the Brahma-saṁhitā. In the Brahma-saṁhitā Lord Brahmā has sung in every verse govindam ādi-puruṣaṁ tam ahaṁ bhajāmi **. Thus Brahmā was initiated by the Kṛṣṇa mantra, by Lord Kṛṣṇa Himself, and thus he became a Vaiṣṇava, or a devotee of the Lord, before he was able to construct the huge universe. It is stated in the Brahma-saṁhitā that Lord Brahmā was initiated into the eighteen-letter Kṛṣṇa mantra, which is generally accepted by all the devotees of Lord Kṛṣṇa. We follow the same principle because we belong to the Brahmā sampradāya, directly in the disciplic chain from Brahmā to Nārada, from Nārada to Vyāsa, from Vyāsa to Madhva Muni, from Madhva Muni to Mādhavendra Purī, from Mādhavendra Purī to Īśvara Purī, from Īśvara Purī to Lord Caitanya and gradually to His Divine Grace Bhaktisiddhānta Sarasvatī, our divine master. mādhava—Mādhavendra Purī; īśvara-purī—Īśvara Purī; śacī—Śacīmātā; jagannātha—Jagannātha Miśra; advaita ācārya—Advaita Ācārya; prakaṭa—manifested; hailā—were; sei—this; sātha—with. Mādhavendra Purī, Īśvara Purī, Śrīmatī Śacīmātā and Śrīla Jagannātha Miśra all appeared with Śrī Advaita Ācārya. advaita-ācārya—of the name Advaita Ācārya; gosāñi—the Lord; sākṣāt īśvara—directly the Supreme Personality of Godhead; prabhu—Lord Śrī Caitanya Mahāprabhu; guru kari’ māne—accepts Him as His teacher; tiṅho ta’ kiṅkara—but He is the servant. Lord Advaita Ācārya is directly the Supreme Personality of Godhead. 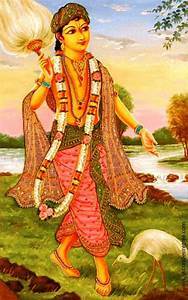 Although Lord Caitanya accepts Him as His preceptor, Advaita Ācārya is a servant of the Lord. jaya—all glories; śrī mādhava-purī—unto Mādhavendra Purī; kṛṣṇa-prema-pūra—a storehouse of all love of Godhead; bhakti-kalpa-tarura—of the desire tree of devotional service; teṅho—he is; prathama—first; aṅkura—fructification. All glories to Śrī Mādhavendra Purī, the storehouse of all devotional service unto Kṛṣṇa! He is a desire tree of devotional service, and it is in him that the seed of devotional service first fructified. Īśvara Purī appeared in a brāhmaṇa family and was the most beloved disciple of Śrīla Mādhavendra Purī. Śrīla Viśvanātha Cakravartī states in his Gurv-aṣṭaka prayer, yasya prasādād bhagavat-prasādo yasyāprasādān na gatiḥ kuto ‘pi: “By the mercy of the spiritual master one is blessed by the mercy of Kṛṣṇa. Without the grace of the spiritual master one cannot make any advancement.” It is by the mercy of the spiritual master that one becomes perfect, as vividly exemplified here. A Vaiṣṇava is always protected by the Supreme Personality of Godhead, but if he appears to be an invalid, this gives a chance to his disciples to serve him. Īśvara Purī pleased his spiritual master by service, and by the blessings of his spiritual master he became such a great personality that Lord Caitanya Mahāprabhu accepted him as His spiritual master. Śrīla Īśvara Purī was the spiritual master of Śrī Caitanya Mahāprabhu, but before initiating Lord Caitanya he went to Navadvīpa and lived for a few months in the house of Gopīnātha Ācārya. 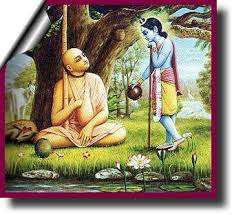 At that time Lord Caitanya became acquainted with him, and it is understood that he served Śrī Caitanya Mahāprabhu by reciting his book, Kṛṣṇa-līlāmṛta. This is explained in Śrī Caitanya-bhāgavata, Ādi-līlā, Chapter Eleven. paramānanda purī—of the name Paramānanda Purī; āra—and; keśava bhāratī—of the name Keśava Bhāratī; brahmānanda purī—of the name Brahmānanda Purī; āra—and; brahmānanda bhāratī—of the name Brahmānanda Bhāratī; viṣṇu-purī—of the name Viṣṇu Purī; keśava-purī—of the name Keśava Purī; purī kṛṣṇānanda—of the name Kṛṣṇānanda Purī; śrī-nṛsiṁha-tīrtha—of the name Śrī Nṛsiṁha Tīrtha; āra—and; purī sukhānanda—of the name Sukhānanda Purī; ei nava—of these nine; mūla—roots; nikasila—fructified; vṛkṣa-mūle—in the trunk of the tree; ei nava mūle—in these nine roots; vṛkṣa—the tree; karila niścale—became very steadfast. Paramānanda Purī, Keśava Bhāratī, Brahmānanda Purī and Brahmānanda Bhāratī, Śrī Viṣṇu Purī, Keśava Purī, Kṛṣṇānanda Purī, Śrī Nṛsiṁha Tīrtha and Sukhānanda Purī-these nine sannyāsī roots all sprouted from the trunk of the tree. Thus, the tree stood steadfastly on the strength of these nine roots. “Śrī Caitanya Mahāprabhu used to say: ‘I am living in this world only on account of the excellent behavior of Śrī Paramānanda Purī.’ ” The Gaura-gaṇoddeśa-dīpikā, verse 118, states, purī śrī-paramānando ya āsīd uddhavaḥ purā. “Paramānanda Purī is none other than Uddhava.” Uddhava was Lord Kṛṣṇa’s friend and uncle, and in caitanya-līlā the same Uddhava became the friend of Śrī Caitanya Mahāprabhu and His uncle in terms of their relationship in the disciplic succession. 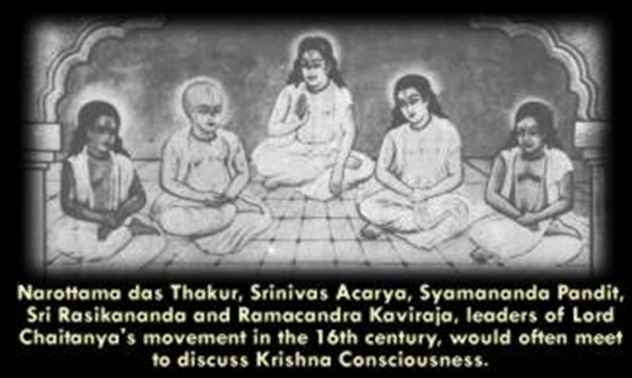 Keśava Bhāratī: The Sarasvatī, Bhāratī and Purī sampradāyas belong to the Śṛṅgerī Maṭha in South India, and Śrī Keśava Bhāratī, who at that time was situated in a monastery in Katwa, belonged to the Bhāratī-sampradāya. According to some authoritative opinions, although Keśava Bhāratī belonged to the Śaṅkara-sampradāya, he had formerly been initiated by a Vaiṣṇava. He is said to have been a Vaiṣṇava on account of having been initiated by Mādhavendra Purī, for some say that he took sannyāsa from Mādhavendra Purī. 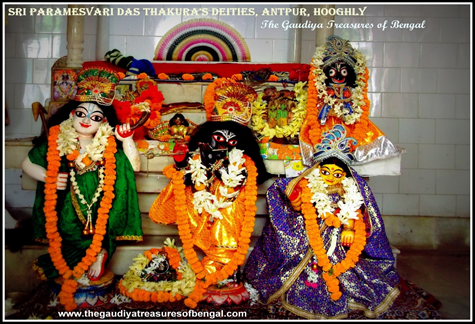 The temple and Deity worship started by Keśava Bhāratī are still existing in the village known as Khāṭundi, which is under the postal jurisdiction of Kāndarā in the district of Burdwan. According to the managers of that maṭha, the priests are descendants of Keśava Bhāratī, and some say that the worshipers of the Deity are descendants of the sons of Keśava Bhāratī. In his householder life he had two sons, Niśāpati and Ūṣāpati, and a brāhmaṇa of the name Śrī Nakaḍicandra Vidyāratna, who was a member of the family of Niśāpati, was the priest in charge at the time that Śrī Bhaktisiddhānta Sarasvatī visited this temple. According to some, the priests of the temple belong to the family of Keśava Bhāratī’s brother. Still another opinion is that they descend from Mādhava Bhāratī, who was another disciple of Keśava Bhāratī’s. Mādhava Bhāratī’s disciple Balabhadra, who also later became a sannyāsī of the Bhāratī-sampradāya, had two sons in his family life, named Madana and Gopāla. Madana, whose family’s surname was Bhāratī, lived in the village of Āuriyā, and Gopāla, whose family’s surname was Brahmacārī, lived in the village of Denduḍa. There are still many living descendants of both families. “Sāndīpani Muni, who formerly offered the sacred thread to Kṛṣṇa and Balarāma, later became Keśava Bhāratī.” It is he who offered sannyāsa to Śrī Caitanya Mahāprabhu. There is another statement from the Gaura-gaṇoddeśa-dīpikā, verse 117: iti kecit prabhāṣante ‘krūraḥ keśava-bhāratī. “According to some authoritative opinions, Keśava Bhāratī is an incarnation of Akrūra.” Keśava Bhāratī offered the sannyāsa order to Śrī Caitanya Mahāprabhu in the year 1432 śakābda (A.D. 1510) in Katwa. This is stated in the Vaiṣṇava-mañjuṣā, Part Two. Brahmānanda Purī: Śrī Brahmānanda Purī was one of the associates of Śrī Caitanya Mahāprabhu while He was performing kīrtana in Navadvīpa, and he also joined Lord Caitanya in Jagannātha Purī. We may note in this connection that the name Brahmānanda is accepted not only by Māyāvādī sannyāsīs but by Vaiṣṇava sannyāsīs also. One of our foolish Godbrothers criticized our sannyāsī Brahmānanda Svāmī, saying that this was a Māyāvādī name. The foolish man did not know that Brahmānanda does not always refer to the impersonal. Parabrahman, the Supreme Brahman, is Kṛṣṇa. A devotee of Kṛṣṇa can therefore also be called Brahmānanda; this is evident from the fact that Brahmānanda Purī was one of the chief sannyāsī associates of Lord Caitanya Mahāprabhu. ]In his Amṛta-pravāha-bhāṣya, Śrīla Bhaktivinoda Ṭhākura gives the following summary of the Fourth Chapter. Passing along the path of Chatrabhoga and coming to Vṛddhamantreśvara, Śrī Caitanya Mahāprabhu reached the border of Orissa. 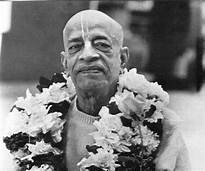 On His way He enjoyed transcendental bliss by chanting and begging alms in different villages. In this way He reached the celebrated village of Remuṇā, where there is a Deity of Gopīnātha. There He narrated the story of Mādhavendra Purī, as He had heard it from His spiritual master, Īśvara Purī. The narration is as follows. One night while in Govardhana, Mādhavendra Purī dreamed that the Gopāla Deity was within the forest. The next morning, he invited his neighborhood friends to accompany him to excavate the Deity from the jungle. He then established the Deity of Śrī Gopālajī on top of Govardhana Hill with great pomp. Gopāla was worshiped, and the Annakūṭa festival was observed. This festival was known everywhere, and many people from the neighboring villages came to join. One night the Gopāla Deity again appeared to Mādhavendra Purī in a dream and asked him to go to Jagannātha Purī to collect some sandalwood pulp and smear it on the body of the Deity. Having received this order, Mādhavendra Purī immediately started for Orissa. Traveling through Bengal, he reached Remuṇā village and there received a pot of condensed milk (kṣīra) offered to the Deity of Gopīnāthajī. This pot of condensed milk was stolen by Gopīnātha and delivered to Mādhavendra Purī. Since then, the Gopīnātha Deity has been known as Kṣīra-corā-gopīnātha, the Deity who stole the pot of condensed milk. After reaching Jagannātha Purī, Mādhavendra Purī received permission from the King to take out one maṇa of sandalwood and eight ounces of camphor. Aided by two men, he brought these things to Remuṇā. Again he saw in a dream that Gopāla at Govardhana Hill desired that very sandalwood to be turned into pulp mixed with camphor and smeared over the body of Gopīnāthajī. Understanding that that would satisfy the Gopāla Deity at Govardhana, Mādhavendra Purī executed the order and returned to Jagannātha Purī. 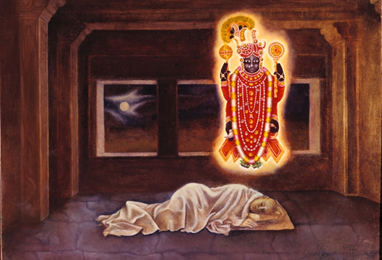 Śrī Caitanya Mahāprabhu narrated this story for Lord Nityānanda Prabhu and other devotees and praised the pure devotional service of Mādhavendra Purī. 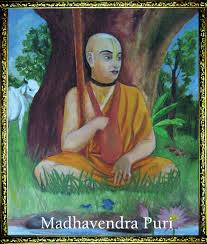 When He recited some verses composed by Mādhavendra Purī, He went into an ecstatic mood. 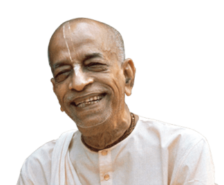 But when He saw that many people were assembled, He checked Himself and ate some sweet rice prasāda. Thus, He passed that night, and the next morning He again started for Jagannātha Purī. 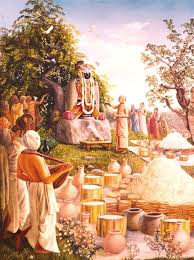 I offer my respectful obeisances unto Mādhavendra Purī, who was given a pot of sweet rice stolen by Śrī Gopīnātha, celebrated thereafter as Kṣīra-corā. Being pleased by Mādhavendra Purī’s love, Śrī Gopāla, the Deity at Govardhana, appeared to the public vision. In the Gaura-gaṇoddeśa-dīpikā, verse 195, it is said that Śrīla Jīva Gosvāmī was formerly Vilāsa-mañjarī gopī. From his very childhood Jīva Gosvāmī was greatly fond of Śrīmad-Bhāgavatam. He later came to Navadvīpa to study Sanskrit, and, following in the footsteps of Śrī Nityānanda Prabhu, he circumambulated the entire Navadvīpa-dhāma. After visiting Navadvīpa-dhāma he went to Benares to study Sanskrit under Madhusūdana Vācaspati, and after finishing his studies in Benares he went to Vṛndāvana and took shelter of his uncles, Śrī Rūpa and Sanātana. This is described in the Bhakti-ratnākara. As far as our information goes, Śrīla Jīva Gosvāmī composed and edited at least twenty-five books. They are all very celebrated, and they are listed as follows: (1) Hari-nāmāmṛta-vyākaraṇa, (2) Sūtra-mālikā, (3) Dhātu-saṅgraha, (4) Kṛṣṇārcā-dīpikā, (5) Gopāla-virudāvalī, (6) Rasāmṛta-śeṣa, (7) Śrī Mādhava-mahotsava, (8) Śrī Saṅkalpa-kalpavṛkṣa, (9) Bhāvārtha-sūcaka-campū, (10) Gopāla-tāpanī-ṭīkā, (11) a commentary on the Brahma-saṁhitā, (12) a commentary on the Bhakti-rasāmṛta-sindhu, (13) a commentary on the Ujjvala-nīlamaṇi, (14) a commentary on the Yogasāra-stava, (15) a commentary on the Gāyatrī-mantra, as described in the Agni Purāṇa, (16) a description of the Lord’s lotus feet derived from the Padma Purāṇa, (17) a description of the lotus feet of Śrīmatī Rādhārāṇī, (18) Gopāla-campū (in two parts) and (19-25) seven sandarbhas: the Krama-, Tattva-, Bhagavat-, Paramātma-, Kṛṣṇa-, Bhakti- and Prīti-sandarbha. After the disappearance of Śrīla Rūpa Gosvāmī and Sanātana Gosvāmī in Vṛndāvana, Śrīla Jīva Gosvāmī became the ācārya of all the Vaiṣṇavas in Bengal, Orissa and the rest of the world, and it is he who used to guide them in their devotional service. In Vṛndāvana he established the Rādhā-Dāmodara temple, where we had the opportunity to live and retire until the age of sixty-five, when we decided to come to the United States of America. mahāprabhura—of Lord Caitanya Mahāprabhu; priya—very dear; bhṛtya—servant; raghunātha-dāsa—Raghunātha dāsa Gosvāmī; sarva tyaji’-renouncing everything; kaila—did; prabhura—of the Lord; pada-tale—under the shelter of the lotus feet; vāsa—habitation.